on our excursions. You’ll be glad you did. 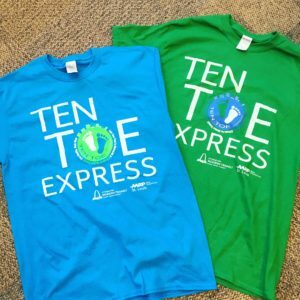 Ten Toe Express Shirts are now available in blue or green in a variety of sizes! Each shirt is $10, including shipping. session. All walking groups get a special tour of a regional amenity. a pedometer, weekly walk logs and transit tickets in a handy tote bag. Walks range from 0.3 to 5 miles, depending on the group and destination. 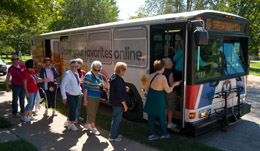 Walking groups meet at MetroLink stations and take Metro transit to the destination. We walk in a variety of places such as Forest Park or Carondelet Park, downtown St. Louis or the Delmar Loop. Groups often finish at a unique shop or stop for lunch or snack before heading back. Register for the Spring 2019 session today! New registrants for the Ten Toe Express® program will receive a Ten Toe welcome kit. New participant kits include a pedometer, weekly walk logs, transit tickets, St. Louis maps, safety tips and a Ten Toe tote bag to hold it all. Get started here. Special Walk info for Spring 2019 has been announced! April 3 – at the Gateway Arch. Find out about the upcoming special walks by clicking here! 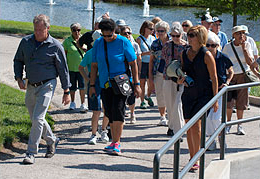 Upcoming special walks feature guest walk leaders from all across the region. Join us on our next walk. Ten Toes Express® T-Shirts for Sale! Ten Toe Express® Shirts are now available in blue or green in a variety of sizes! Each shirt is $10, including shipping. Walking Groups. Sizes, colors, and quantities are limited. Click here for more details and to place your order. Schedules for our Walking Groups are posted online as they are made available. All walks are lead by experienced Walk Leaders and leave from MetroLink stations. All go to a variety of places and attractions. RSVPs are often required. Visit our calendar to get a quick look at what our walking groups are doing. Details. The Spring 2019 registration dates are out. Find a date that works for you here! The Spring Kick-off Walk is set for April 3. Find it here. Remember that schedule updates will be posted here first! See the new calendar here. We get to our walks via MetroLink and MetroBus. It’s comfortable, economical and environmentally friendly! The Spring 2019 Ten Toe Express Kick-off walk is April 3. Learn more about this and other special walks here.